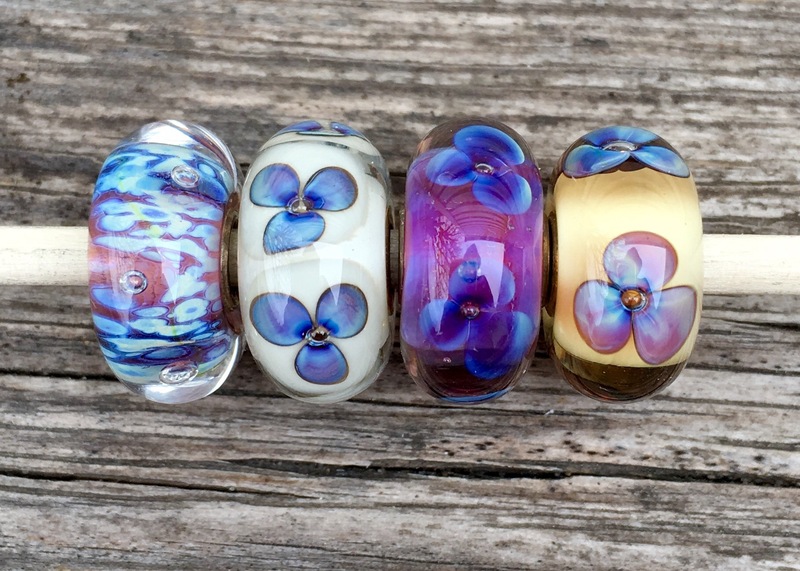 There has been some discussion on Instagram of late about beads that sit there and don’t get used. 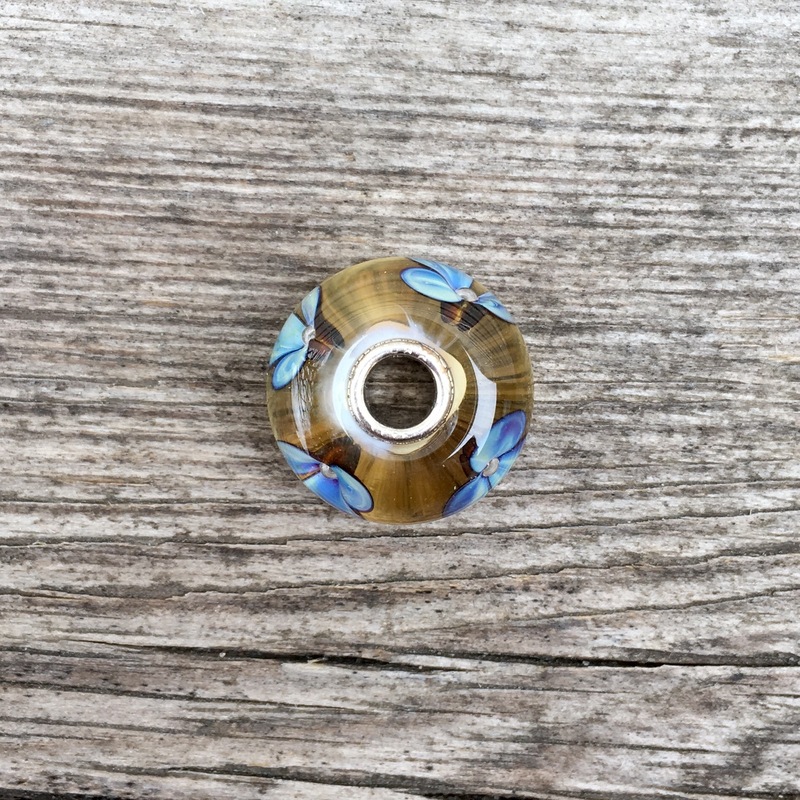 I have such a bead and thought I’d give it some attention, so it doesn’t feel unloved. I had no idea what it’s called even, that’s how unloved it was. I looked it up and it’s called Ivory Violets. It’s from the Purple Heaven Kit and I do have 3 other beads from that kit that I’ve bought separately. L-R are Moonlight Bubbles, Ivory Violets, Aurora Flower and Amber Violets. It’s different from Amber Violets, not only in colour, but also how the flowers look from the side. The ivory colour goes with nothing that I have. I have a few white beads but the ivory totally clashes with the white. It looks good with the Sky Blue and Royal Viola True Beadz, so that is a possibility. 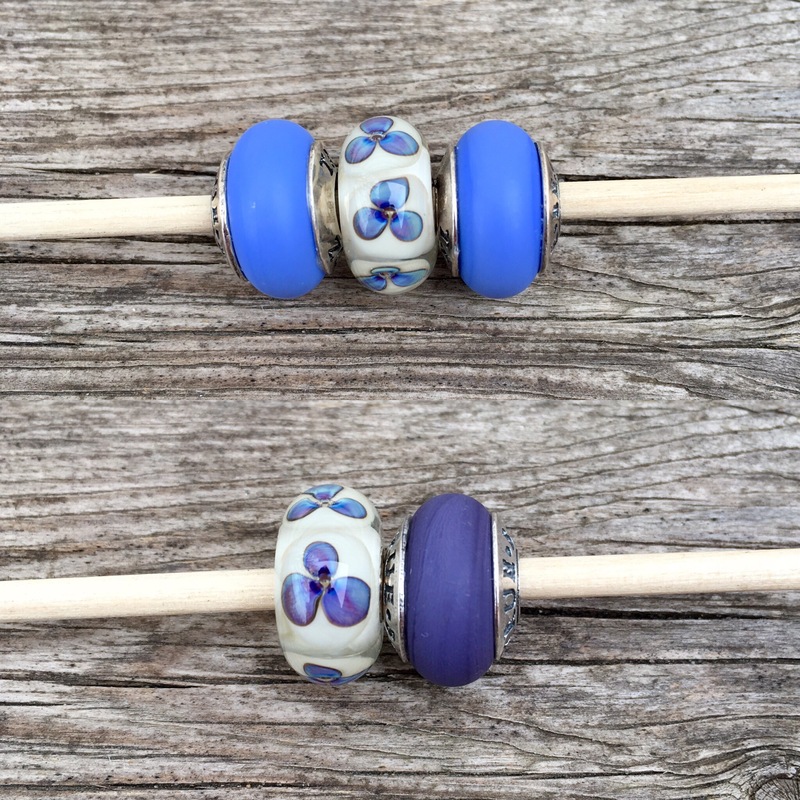 One of the flowers on the Ivory Flowers has slightly more purple, which accounts for these two looks of the same bead. In the end I decided to put the bead with its mates from the Purple Heaven Kit. Since it was quite flowery, I tried to make it a bit more modern looking with some chains each with one spacer. 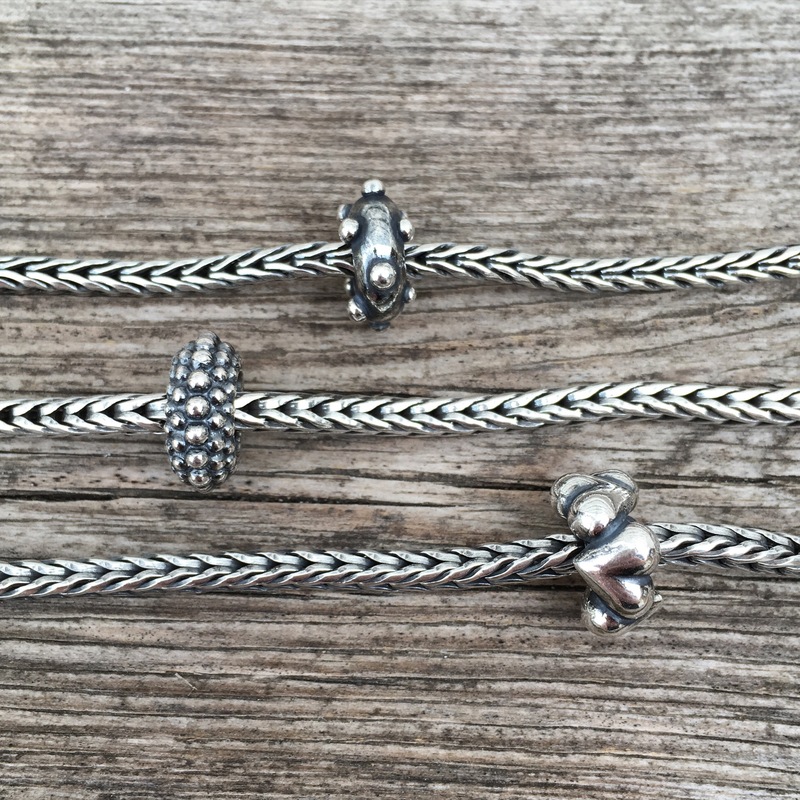 Top to bottom are Dot’n’Dot, Sweet Berries and Connected Love. 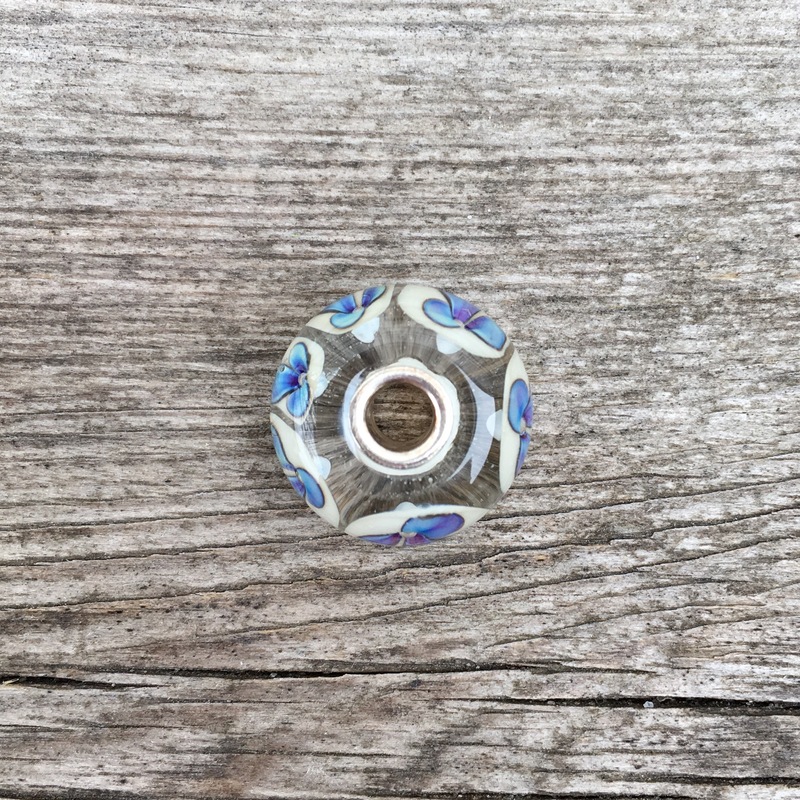 So here is the combo and I’m very happy to use this bead today! All right, let’s hear about your unloved or neglected beads! Well, that’s a happy ending! Great that they had similar colours! It is an strange coincidence that you chose to write about that very bead! 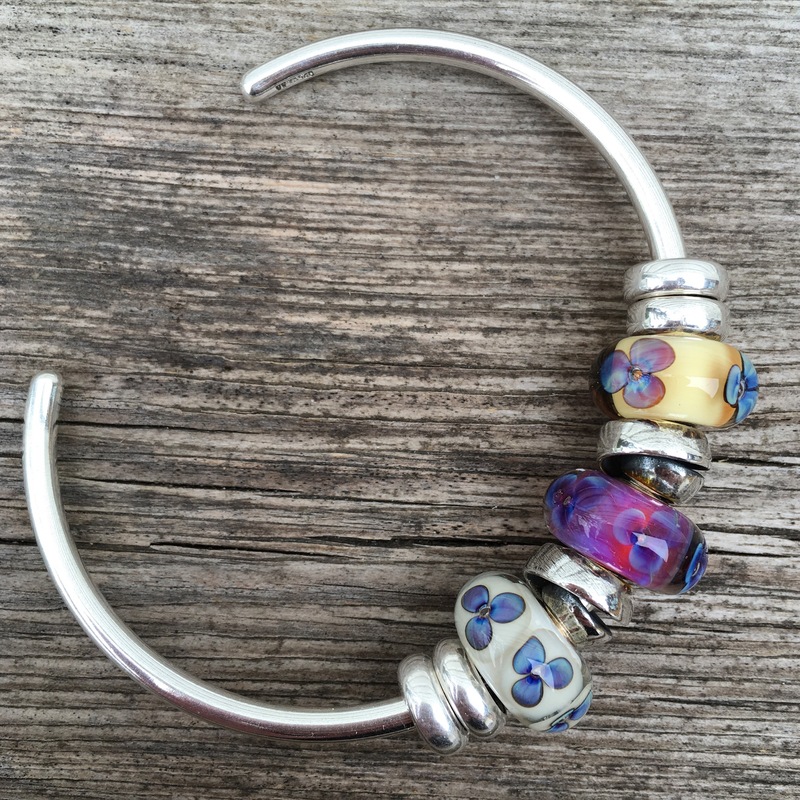 I have looked at it over and over on line and thought about buying it because I love flower beads. I like the colour of the flowers but keep resisting it because of the background colour! Yes, I agree it looked a bit stark with the solid colours but wasn’t able to articulate that. I’m going to try to use it more often, but you’re right, it’s a quirky bead. Funny that you had been looking at it! Kim, I’m sure you are not alone with that thought! 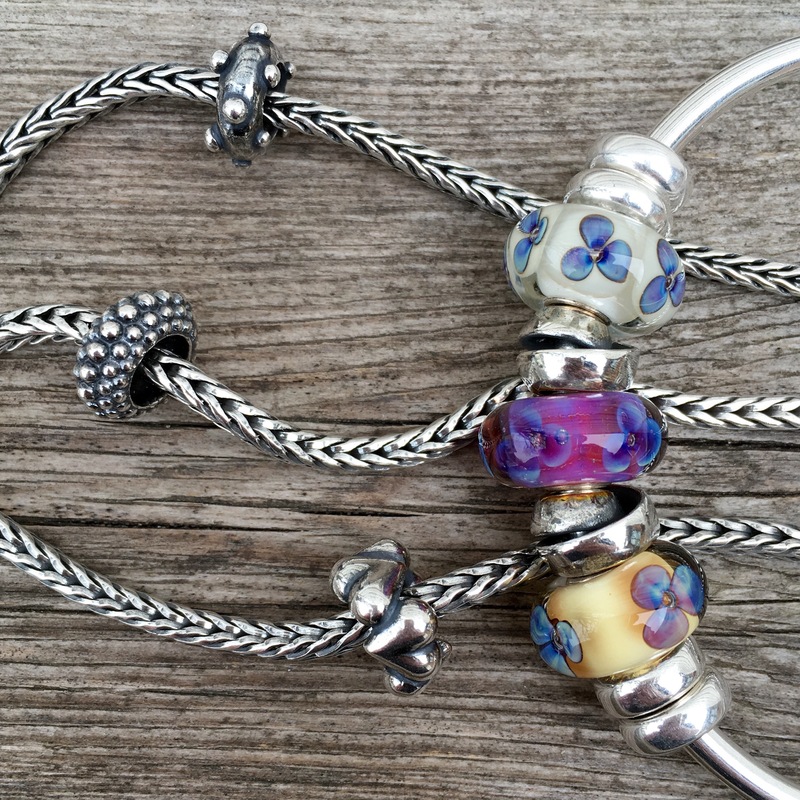 The other day I was thinking about my old Pandora beads which I hardly wear any more and I had the exact same thought. I agree with you Martha! I tried to get rid of some beads a few weeks ago, and I managed to sell one, and instantly regretted that. Now doing that again soon. I am just afraid a bead will prove to be perfect for a combination in the future. Yes, that would be the worry! I relate to what everyone is saying about not wearing beads but being reluctant to sell them! I have the two other beads from this kit and I seldom wear them. Although one did sneak onto a bangle recently. The other one I am not sure if I’ve worn it or not. I think this is one of those kits that works well as a kit but is difficult to work with. Poor unloved beads, although Panda had an outing today so I am trying to share the love! Debbie, I was wondering if that’s why Panda had made an appearance! I really should have bought the Purple Heaven Kit when it came out. I think with the whole kit I would have used Ivory Violets much more. Yep, Panda is not unloved because I think it’s a sweet bead but I had nothing to go with it when I was wearing full bracelets. 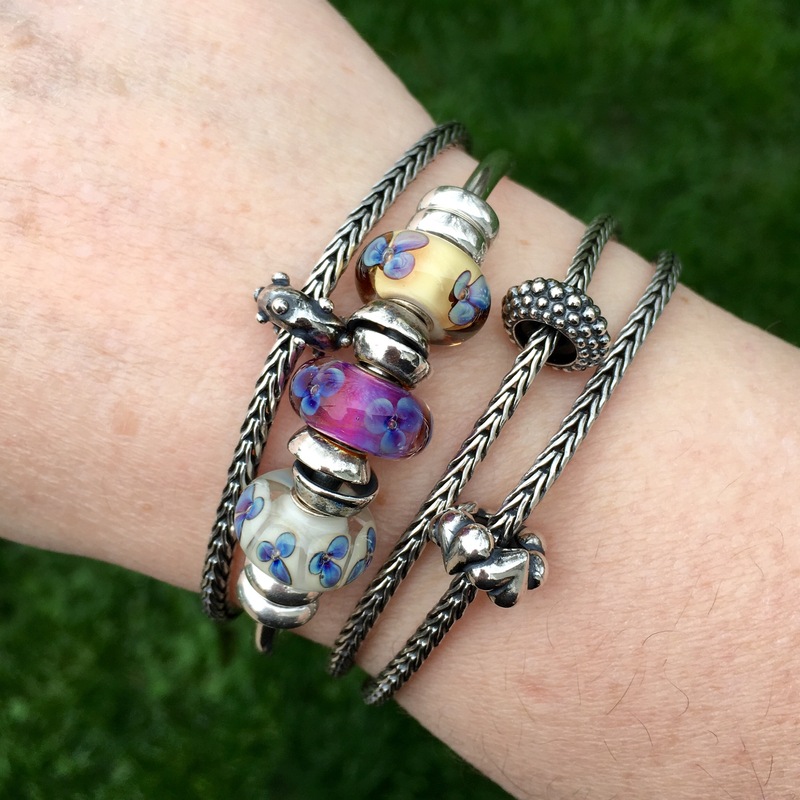 At the moment I am into bangles so it gives more scope to use beads I have that don’t fit on a bracelet. Too many beads bought because I liked them with no thought as to how I would use them, and no bracelet design plan!!! I think we’ve all bought a few beads because they are pretty but we didn’t have a plan! That’s what I really like about bangles-it’s quick to throw on one bead just to showcase it for a bit. I have 2 ivory violets, one is a large bead with pale, faded denim colored flowers, the other smaller with deep purple flowers. I hate the big one, don’t like bigger beads in general…but I like the smaller one. The white patches around the flowers are not as obvious on the smaller versions too. As for unloved beads, I’ve got about 10, plan on selling or putting up for trade somewhere. I know I’ll never use them. The smaller one sounds really nice! Yes, might as well get something for the beads you don’t use.